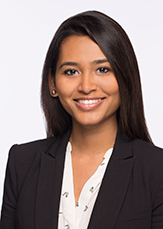 Manali is an Associate in our Real Estate Group, focusing on both, commercial and residential real estate. She joined Harris, Sheaffer LLP after articling with a boutique firm specializing in commercial leasing. Manali’s practice includes acquisitions and dispositions of real property, institutional lending, and financing transactions.